I'm a bit behind and doing me reviews back to front, but it'll all come out ok.
A spate of child killings has stricken a terrified Berlin. Peter Lorre gives a legendary performance as the murderer Hans Beckert, who soon finds himself chased by all levels of society. From cinema’s first serial killer hunt, Lang pulls back to encompass social tapestry, police procedural, and underworld conspiracies in an astonishingly multi-faceted and level-headed look at a deeply incendiary topic. 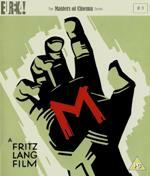 One of the greatest psychological thrillers of all time, M remains as fresh and startling almost 80 years on. M is a truly great film whose influence can be felt throughout the history of cinema. Fans of Hitchcock and Kurosawa will especially enjoy the story, which is much more thrilling, and frequently funny with great little gags, than you may expect from a flagship of German Expressionism. We’re in proper full-on film nerd territory, people, and still having fun! This is one of the seeds of the cinema we watch today and when you see the masterful grasp of all the components that director Fritz Lang has, you'd be forgiven for thinking it's all downhill from here. It's the first of its kind, yet it seems effortless. A star rating is really quite cheap in this case. Hitchcock’s history with German Expressionism is well known, and the opening scene of M would suit any of his thrillers, as a woman tenderly prepares lunch for her daughter, who is currently being led astray by Lorre’s whistling madman and a balloon. Just as with Hitchcock, the viewer has the advantage over the character, knowing exactly what is happening and the inevitable conclusion. It’s a powerful, haunting and sobering scene. And like Kurosawa, Lang’s compositions are broad and stylish, while his social commentary is sharp and not in the least bit dated. In fact, he comments in an interview included in the superb booklet with the Blu-Ray, that he based many of the elements on true stories from news reports and was so fascinated by the idea of criminals taking to the streets to track down the murderer as well, that he worried someone else would film it first. Ironically, I can’t think of another film with such a plot used in that manner so he hardly had to rush it! And it is such a great idea, I wonder why it hasn’t been used since. Certainly the metaphor of a sociopath and his place inside or outside society has been done frequently in a wide range of styles, but not this sharp. That’s surprising in one sense because modern plots of this sort would be claustrophobic, fascinated by the relationship between criminal and prosecutor, but M has a huge canvas by comparison. It’s an ambitious, yet assured and clearly defined view of society; how the good and bad (plus ugly! It’s the beggars that are most effective in the search) elements have to balance and how such a random murderer threatens everybody. Just when you think that thread has played out, the story takes a rather absurd turn (in a good way) to question how society should deal with such a problem. The mob-rule lynch mob angle is another element we can identify clearly with today. Such madness permeates the film, not least in Peter Lorre’s iconic and mesmerising performance, especially as he is off-screen a lot, so he has to earn his moments. Consider how such a part would be unlikely to have been accepted within Hollywood without severe concessions and it’s easy to see how honest Lorre is being. The rest of the cast are very good too and there are a lot of memorable characters, not least Otto Wernicke as the Inspector who embodies the films theme with an entertaining relationship with the criminal fraternity. Lang’s photography is just gorgeous. He wrenches potential out of every shot. A German being very Expressive, I suppose! There are all the founding rules of Noir to be found, in the shadows and the angles, but look also for the humour, such as the large man accusing the small man of being the murderer; it’s like a comic strip and as the poor chap peered up at his accuser, I almost expected the subtitles to read “Gulp”! There is a lot of silent film, which is partly down to how expensive sound was then, but more to do with how Lang presents the film. The silent sequences of police raids are eerie and when sound comes back in, it’s a powerful device. Editing is paramount in these moments, but is something to behold throughout, especially juxtaposing between scenes of the police and criminals having similarly problematic meetings. He plays with the narrative cleverly too, as we get scenes-within-scenes. I can’t recommend this film any higher than must-see. It might be film nerd nirvana and historically important (no, essential), but it’s also bloody good watchable entertainment. In this epic sci-fi tale, which spans more then a thousand years, cult director Darren Aronofsky explores the age old question "what if you could live forever?" Hugh Jackman stars as Tom Creo a man torn between three parallel lives faced with the ultimate struggle - to save the life of Izzi (Rachel Weisz) the woman he loves. Merging fantasy and science fiction in a unique way, Darren Aronofsky's visually ground breaking story addresses mans eternal struggle with mortality. 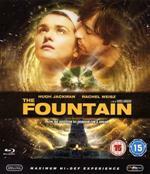 The Fountain is a simple, romantic tale of love and death and how the two are entwined. Simple. How it’s told is another matter entirely! Hugh Jackman plays the role of Tommy and his wife Izzy is played by Rachel Weiz and the chemistry between the two is very true and believable. While Jackman is barely off-screen throughout the three incarnations, Weiz is most grounded in the modern day version of her character and she gives a heartbreaking performance. She captivates in her “other” role as Queen of Spain too. But it is Jackman who we follow and he is excellent across the board. Interestingly, the first cast was Brad Pitt and Cate Blanchett who would go on to do A Curious Case of Benjamin Button. It is possible to find similarities in the central themes of both films (both use fantasy as a metaphor), but The Fountain, while being far more ambitious, is also the more heartfelt. Maybe being cancelled once and having to eventually slash his budget helped Aronofsky, because Button has a simpler tale and clearly blows an extravagant production only to disappear firmly up its own arse. I really enjoyed Darren Aronofsky’s production of the film. He has a very solid style, concentrating in composition and focus to create an emotional and visually sumptuous photography. It occasionally looks fantastic, but never otherworldly. Even the future incarnation with Jackman in a bubble with a tree; the focus is on making it tangible and real, through close-ups and sound. It makes for a fascinating film. As I’m sure you’ll realise the narrative is all bendy and wobbly! Yet it isn’t a challenge to follow and if anything, it’s oddly a bit obvious. The two main strands (Modern Day and Spain/South America) both share recurring motifs and slot together beautifully, with a book written by Izzy connecting them and creating the basis for the “Space Traveller” sections too. While following the film is simple enough, understanding it is another matter! By the end, it may be a little too enigmatic. Maybe bound too tightly to forcing a conclusion or simply unable to cohesively demonstrate the central truth, like a child trying to explain quantum physics- maybe he knows, maybe he doesn’t, but he’s making no kind of sense either way! We’re in 2001: A Space Odyssey territory to some extent, but because there is such a defined story at the heart of The Fountain, you might feel a bit abandoned in the final act. Certainly it is too dependent on the viewer’s interpretation, but there should be no doubt in the yearning romantic passion and thriving original creativity at the centre of The Fountain. Should you be so inclined, it is a remarkable journey and the commitment of all involved makes it a very watchable one. Hailed around the world as one of the greatest movies ever made, Vittorio De Sica's Academy Award-winning Bicycle Thieves defined an era in cinema. In postwar, poverty-stricken Rome, a man hoping to support his desperate family with a new job loses his bicycle, his main means of transportation for work. With his wide-eyed young son in tow, he sets off to track down the thief. Simple in construction and dazzlingly rich in human insight, Bicycle Thieves embodied all the greatest strengths of the Italian neorealist movement: emotional clarity, social righteousness, and brutal honesty. Bicycle Thieves should be required viewing by any modern filmmaker. Without money, without hype you can still make something genuine and powerful, in fact, more so. When you think about the story, there is no escaping the misery. Antonio finally has a job, but his bicycle is essential and it’s in the pawn shop. His wife, Maria, pawns her linen, which was part of her dowry, to get the bike back. And then on Antonio’s first day, it gets nicked! The following day, he and his son Bruno traipse around the city trying to track it down, while a sense builds that this is part of a cycle (no pun intended) and the people who stole it are not malicious, but suffer the same daily problems. How long can a good man survive? And that is it so far as a plot is concerned. Barrel of laughs that one, eh? But there is a point to Italian Neo-Realism, which is easiest thought of as the opposite of German Expressionism, which uses visual storytelling to wring potential out of every scene, usually via a set or even a scale model of a set, so every angle can be controlled. Mise en Scene becomes essential as everything is carefully tailored to express the meaning behind the story. Neo-Realism never uses manipulation like that. Locations are real and everything is stripped back to bare essentials, to reveal a social conscience with absolute honesty. Casts are often made up of normal people and dialogue is succinct and real. Small moments normally dismissed as superfluous become huge, while a sense of mood and the tiniest gestures take on paramount importance. In this story, while chasing that bike, you see what’s really important for Antonio (Lamberto Maggiorani). You might hardly notice on a first viewing the way his relationship with his son Bruno (Enzo Staiola) is drip-fed in with the most delicate touches and it is the same for the character who in a sense is losing focus of what’s important. Not to downplay the importance of that bicycle, it really is essential, but the longer he spends running around after it, the more likely things will get worse. So a story that on paper is sorrowful, becomes magical. The key to this is in no small part to the natural charisma of Staiola as Bruno and his expressions in the pivotal cafe scene are wonderful. If you want an emotional connection to characters, there are none better than Bicycle Thieves and you will be rewarded with a sublime ending. It’s a technique I’d love to see used more full-blooded these days too, which is why I wanted to like Rachel Getting Married more than I did. I suppose it’s a technique that offers nowhere to hide so if the film is rubbish, you can’t rescue it in editing. It will always be crap! 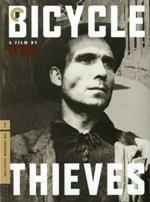 Bicycle Thieves is one of the reasons I get frustrated by “greatest films” lists. I love Citizen Kane, but this film, which came eight years later or so, is just as important for an entirely different approach. How can one be “better” than the other? Hitchcock, steeped in German Expressionism, nevertheless would be quicker to thank the Italians for elements of I Confess or especially The Wrong Man. A tall, handsome "preacher" - his knuckles eerily tattooed with "love" and "hate" - roams the countryside, spreading the gospel...and leaving a trail of murdered women in his wake. To Reverend Harry Powell (Robert Mitchum), the work of the Lord has more to do with condemning souls than saving them, especially when his own interests are involved. Now his sights are set on $10,000 - and two little children are the only ones who know where it is. "Chill...dren!" the preacher croons to the terrified boy and girl hiding in the cold, dark cellar...innocent young lambs who refuse to be led astray. 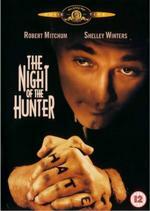 Night of The Hunter is an odd film. A good thriller with a great villain is the basis and the hook, but the real story is about two orphans finding a home. It’s full of religious sub-text and ranges from a genuinely scary, profound brooding fairy-tale to just plain nuts. You can only decide for yourself where between the two it lies overall. Shirley Winters doesn’t help. Maybe it’s her, maybe it’s the awful dialogue, but either way her role as John and Pearl’s mother is weak and misjudged. The story only feels like it gets going once she’s out of the way, courtesy of Robert Mitchum’s fantastic Preacher, Harry Powell. I suppose you might consider that a spoiler, but trust me, Winters’ is such an annoying part, you’ll be hoping she’s gotten rid of, so I’m helping you enjoy the good stuff, really I am! You might also vainly hope for the untimely demise of Evelyn Warden’s Icey Spoon, another shrill horrible character, full of self-importance, but as an unwitting supporter of the preacher, Harry has no reason to do her in. Damn. The best supporting character from the first part is James Gleason as Uncle Birdie, but he is underused. Luckily, the nature of the plot sees the two kids flee Powell by escaping down river where they are rescued by Mrs. Cooper (Lillian Gish), running a sort of make-shift orphanage for a few girls. From the moment their mother has left to their acceptance into a new home, the film is wonderful. Mitchum is a foreboding presence and a tangible threat. He gets more than a few iconic moments, be it up close as he explains the tattoos on his knuckles, or as a distant silhouette, an almost ever present shadow over the children. Billy Chapin and Sally Jane Bruce as the children do very well. Billy as John has to lead the film, essentially, and Sally is cute with some killer lines as his younger sister Pearl, who never lets the doll out of her sight. I loved her expression as she played with the money, or especially her fascination with Mitchum’s knife. This was renowned actor Charles Laughton’s only film as director and I think he saw it as a story clearly from the kids point of view. It would make a fantastic kids book because it’s full of hope and fairy-tale darkness, with a healthy, if fervently religious, moral core. It’s only awkward until the plot is focused on the children, their nemesis (Powell), John’s guide (Uncle Birdie) and their salvation (Mrs. Cooper); and knowing Lillian Gish is keeping everything right in the world is a comforting thought for anyone! Throughout there is some wonderful imagery (like Winter’s watery grave and the gentle, lonely journey downriver) that suggests Laughton’s had a madman’s eye and could have been considered an Auteur, should he have done more. If we could consider Winter’s exit the actual start of the film, this would be a classy, dark thriller of the highest order with a healthy dose of insanity that gives it a special, unpredictable and scary personality. Still, it is a recommended classic nonetheless. 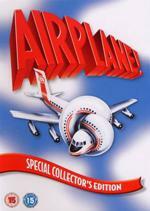 What can I possibly say about Airplane!? It is one of the silliest comedies ever made, the first of Zucker and Abraham’s much loved style that in retrospect peaked early with Naked Gun and tailed off pretty quickly (Scary Movie 5? ), destroying poor old Leslie Nielsen’s career in the meantime. So maybe they have been responsible for more bad than good (it did at least stop all those bloody Airport films), but that doesn’t stop Airplane! being amongst the truly funniest and most quoted comedies of all time. Surely I can’t be serious? You bet I am. And stop calling me Shirley. If you’ve never seen it, I’d describe it as relentless. It seems determined to make you laugh at all costs by throwing gags at you by rapid fire. If one doesn’t work, the next one right on its tail might! You’re bound to miss things and that makes it fun to watch again. And again. The key to it is the cast, who play it deadpan serious throughout. That’s why Nielsen found a new routine to get stereotyped in, despite his excellent work in things like Forbidden Planet, which sadly has now been forever tainted by expecting him to come out with some daft line every two minutes! You know Jon, I feel that this is one of the most overrated films, from a critical viewpoint, in the history of film. I don't fault Laughton's direction, because he takes a somewhat ridiculous screenplay and makes it look really wonderful on screen. I can't fault Robert Mitchum, because he plays the preacher with such a believable menacing personality. The fault lies with two things. First, Billy Chapin has to be one of the worst child actors in the history of cinema. Wooden and vacant in his delivery of his lines, he proves that his sister Lauren (Father Knows Best) was the talented progeny in that family. And second, the ridiculous notion that once they meet Mrs. Cooper and she surmises the danger that the two children are in, she fails to call the police. I've seen this film now, three times, and it gets more ridiculous with each viewing. Seeing as how Nielsen's career was pretty much on the downside back in 1979, I think he pretty much rode the wave of success that this film created for him. I thought Billy Chapin did ok and I didn't find him wooden. I especially liked the scene with Uncle Birdie, where he just walks off. It can be seen as wooden, but I felt it was more like a kid thinking, "I'm off!". It can be so hit and miss with child actors, and he's still better than that strange, cross-eyed robot kid in Shane! He is also better than Shelley Winters, shockingly. But he is overshadowed by the sister. When Powell says something like, "we're going to talk about secrets", I loved how even her tone changed just on the simple "no!" that she replies with. Regards Mrs. Cooper, she can be excused initially on the basis that Powell may be nothing more than an abusive father. She doesn't know the circumstances. She needed Powell to be caught almost red-handed and calling the police too early could allow him to charm his way out and even get custody of the kids. On the other hand, the whole plot is metaphorical, so the characters become cyphers within an enclosed world. That excuse gets severely stretched though. I've always been fond of this film, but I do agree I see more wrong on each viewing. That just makes it even stranger though and it's a unique atmosphere. Have you ever seen Running Scared? Strike me down for mentioning a Paul Walker movie in a serious discussion, but that also has a weird fairy-tale vibe to it that makes it worth seeing. You know Jon, I feel that this is one of the most overrated films, from a critical viewpoint, in the history of film. I thought that would have been Pulp Fiction...? I remember quite liking it when I saw it not all that long ago. It was tight story telling and had me quite excited throughout. I don't particularly remember the acting sticking out as a sore thumb, but I may have paid attention elsewhere. In that case, it would have read the most overrated group of films in the history of cinema. I start a thread with German Expressionism, move into Italian Neo-Realism and still end up with Tarantino! I know, Quentin's like a pox huh? No, not at all, clearly he is at the forefront of cinema. There's no denying his brilliant contribution to film.